Aragón Sarrià Center has been and continues to be, for many years, as a second home for us. The friendship we have had with the house and lots of times we have participated in the events held there at different times so the group shows. Here we have good friends and, since the beginning of this century, the space where we rehearse. The first Mexican party organized to raise funds for Calli Mexica (which was the first Mexican association that wanted to take the responsibility of representing Mexico in the house of Barcelona from civil society) to promote the culture of our country, nonprofit was in the CAS (Centro Aragonés Sarria). The Aragonés Center party and presentation to the membership has been making tradition and every year we make a special presentations for those who have been watching us grow as a group and as mariachi along our path. In the Center we have made concerts, parties, lodges, theater plays and we have shared with many people many pleasant moments. The history of this Mariachi of Barcelona is linked to this center for years of good people who like mariachi music. Many people told us that in their childhood, in their villages, in many parts of Spain, but especially Aragonese, they listened to songs that became so famous due to the voices of Jorge Negrete , Pedro Infante , Miguel Aceves Mejía and Antonio Aguilar . Many people grew up admiring our culture in the films of Mexican cinema golden era. And they learned, grew and endorsed many songs. Every year when we turn up at the Center partners out there come to sing with us, singing duets, with passion and enjoy singing Mexican songs of a lifetime. 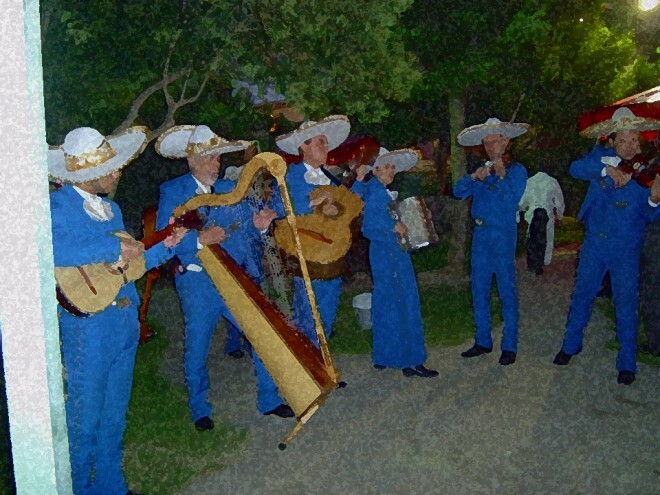 There are even friends who have dedicated themselves to delve much into the paths of current mariachis and make us a little update with some repertoire that seems to be heard only in Mexico.